The Bruno Cowtipper Pro II 90 has enough classic American tube tone and clean volume to tip a heard of cows. This American style reverb amp is perfect for anyone. What sets this amp apart from the Cow Tipper 45 is the tremendous amount of clean headroom it has. This is an amazing Jazz amp with rich, warm complex tones and enough clean headroom for even the loudest Jazz requirements. The best Archtop guitars come alive and really sing through the Cowtipper 90. 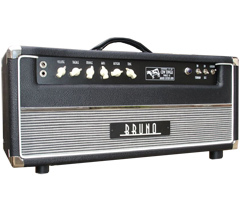 It features 90 watts of Quad 6L6 power, 2 - 12AX7s, 2 - 12AT7s, and a solid state rectifier for maximum clean headroom. The cabinet is constructed of solid pine for its sweet brightness and then fine tuned with a birch ply baffle for superb resonance. Finger-jointed construction is used just like the finest furniture which provides a very strong, extremely rigid, rattle free cabinet that will last a lifetime. Other features include premium tolex coverings, padded handles, heavy duty feet, stainless steel screws/bolts and chromed steel corners. Standard finishes are black, brown, dark green, red or cream with an Art Deco style control panel and aged Ivory "chicken head" knobs. The Cowtipper 90 is the clean volume king of tone and complexity. It is available as a head and a 2X12 combo and is just awesome for Jazz.